Hello, it’s feline blogger Clyde at your service *wildly waving* with a special edition of Black Cats Tell All Monday. 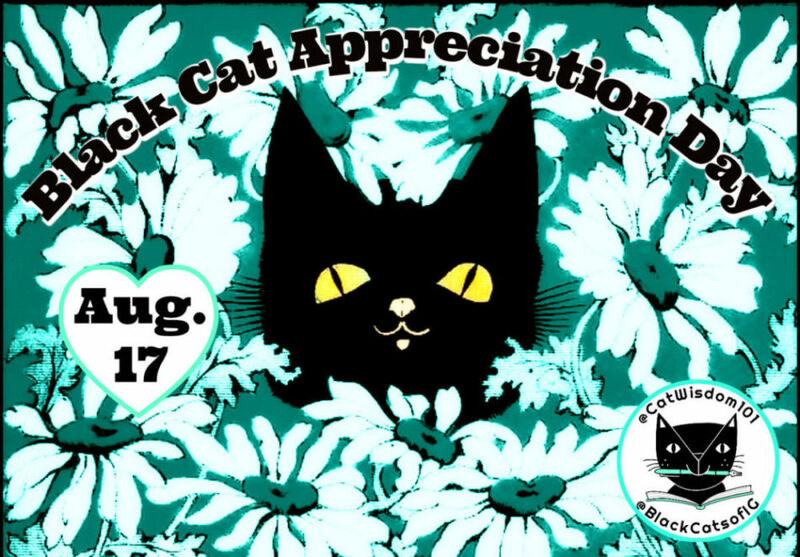 Black Cat Appreciation Day is Friday, August 17th but I couldn’t wait. Every black cat holiday is a reason to celebrate, coo over mini-panthers and squish lingering superstitions. 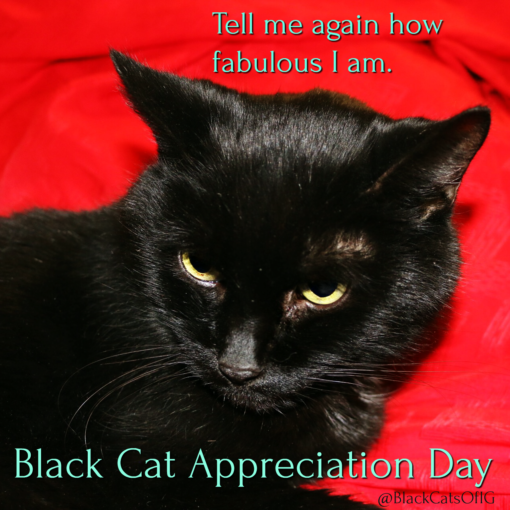 Every day we get closer to our goal and of course, every day is black cat appreciation day here. 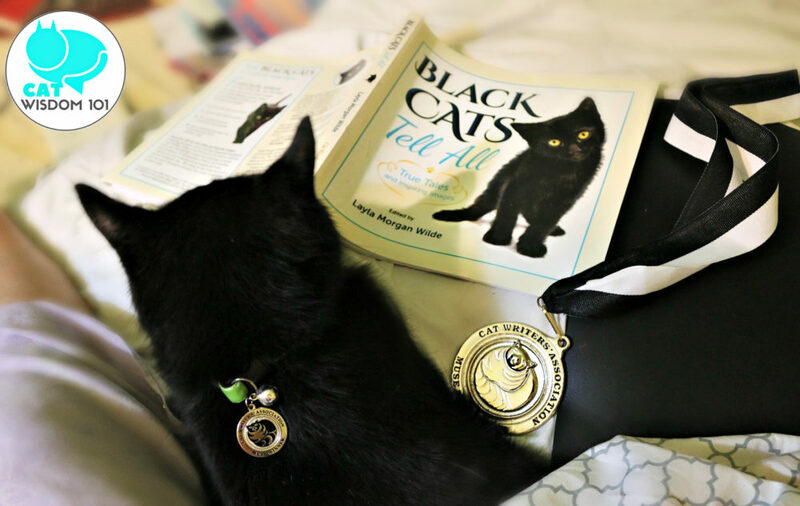 Since we launched our global nonprofit book Black Cats Tell All: True Tales And Inspiring Images during Black Cat Awareness Month in October 2017, the world has taken notice and black cat love is growing. When we launched our black cat community on Instagram @blackcatsofIG over a year ago there has been an explosion of individual and business black cat accounts from all over the world. The most popular hashtag is naturally #blackcat and #blackcats but we are in the #3 spot with #blackcatsofig with over 200K posts and #blackcatstellall is in the #9 spot with over 30K posts. That’s a lot of black cat love. Thank you to everyone who helped the cause and continues to be a black cat adoption advocate. Together we really have made a difference one house panther at a time. My mom, Layla found this old photo of me on the day I started my new life here. What a difference indeed. To share the love, I purrsonally selected a few of my favorite pics from those who used #blackcatstellall recently. A few of the cats are featured in the book but I’m madly in love with a bunch of new cats who aren’t. I’d love to create a new Black Cats Tell All but my mom, Layla, would have to clone herself or win the lottery to hire a team. She is in burnout recovery and was supposed to be on a flight to Finland tonight to bring her mom’s ashes but canceled. Things are, shall we say “up in the air”. For now, enjoy the full-color spectrum of wildly different black cats with color commentary from moi. Vivi and Lulu are a bonded couple. Lulu has a very unusual tail. Whaaa, these four foster kitten cuties #thesootsprites have been going to an adoption event every week for weeks! Come on L.A. area folks, please give Mango, Dusty, Rocco, and Kiki a chance. Also their very young mom needs a home. A mom and a kitten is a great choice and of course, pairs are always preferable. That said, I know many very happy trios like the gals from @blackcattrails. Their sister Mays is missing from this pic but you can see them camping and kayaking in our book! They are true adventure cats. Our chat noir friend in France, Sonja, is cuckoo for Cocowhip. It’s dairy-free and safe for cats. Me wants some right meow! Celebrating cat birthdays is a thing on IG. Our friend Bella who lives in Norway just turned two. A treat I dream about is Dreamies but it’s not available in the U.S.
Nanu hails from the same state where I was adopted from. He’s a super energetic adventure cat who also loves TV and games. I find all black cats extra curious and dare I say smarter but sometimes there is a fine line. Nanu is a good example of a cat who is encouraged to get into trouble. All I can say from watching all his videos is careful what you wish for. There are no bad cats. 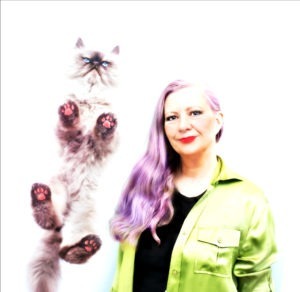 No bad black cats but there are humans who are unwitting influencers of feline behavior. Many of the black cats I know are indoor-only. They love window-watching like Philly girl Gipsy Kit who isn’t afraid to express herself. This does my heart good. In Japan, black cats are considered lucky and children learn to respect cats from a young age. This is the beginning of a beautiful friendship. You can see all their videos including the baby pulling his tail, a gentle exercise in exploring boundaries. It’s crazy that some people think babies aren’t safe around cats. It’s a matter of perception, education and common sense. I think my job is done. Happy Black Cat Appreciation Day, Week, Month, Year, whatever. Black cats are so sweet and beautiful! Happy Black Cat Appreciation Day/Week! What a series of gorgeous black beauties! And since I was at home with them, I could teach them all the things they needed to know about life and good behavior with kitties, even from infancy. Why this book isn’t number one in the best seller list when wrapped i so much black cat gorgeousness we have NO idea! Thanks for all you do for black cats, we think black cats rock! We have three in our feral family and they are super special! we knew that the book and all of its branches into other media would be a success and accomplish what you wanted it to. Thanks for the updates dear Clyde! We try to encourage everyone to consider a black cat for adoption. If we are at Petsmart we try to draw attention to the little panthers so they will be seen. We think that they should be on top and always have on fluorescent collars to help draw attention to them. Many times people actually comment to me that they literally didn’t see them. Happy Black Cat Appreciation Day to all! Luvs to all kitties of every color! 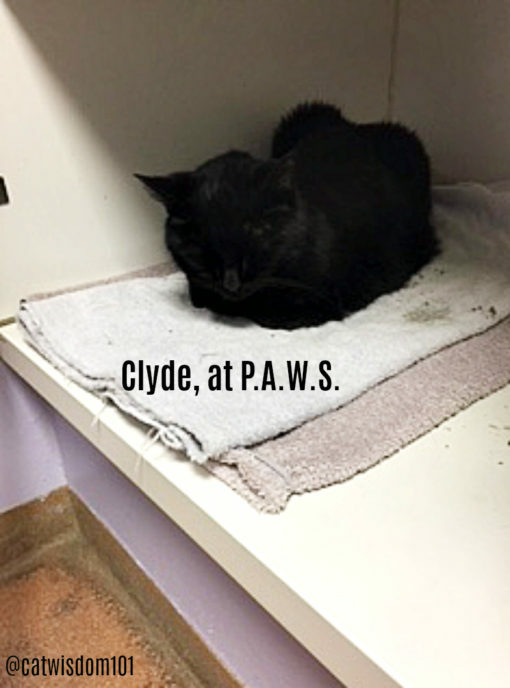 Clyde, we think Black Cat Appreciation Day is every day! Happy Black Cat Appreciation Day!!!! Those black cat pics are pawsome. This black and white tuxie loves her all black sisters. And her mom loves black kitties too. Good luck to ALL kitties waiting for forever homes! It’s so awesome, seeing all the black cat love! Manny and Chili Bruce as the most adorable twin black cats EVER! Every day, The Hubby and I melt with love for our housepanthers. Our one friendly feral Sweetie is a black kitty too, and the fact that she allows us to pet her is fantastic! May we use your badge on our blog too?